Camel Pose. Camel Pose is a transition between the simpler prone backbends like Locust (shalabhasana) and the more challenging backbends like Upward Bow Pose (urdhva dhanurasana). For this pose you can pad your knees and shins with a thickly folded blanket. 1. Kneel on the floor with your knees at hip width and thighs perpendicular to the floor. Rotate your thighs slightly inward, narrow your hip points, and firm but don’t harden your buttocks. Draw your inner groins deep into your torso. Keep your outer hips as soft as possible. Press your shins and the tops of your feet firmly into floor. 2. Rest your hands on the back of your pelvis, bases of the palms on the tops of the buttocks, fingers pointing down. Use your hands to spread the back pelvis and lengthen it down through your tail bone. Then lightly firm the tail forward, toward the pubis. Make sure though that your front groins don’t “puff” forward. To prevent this, press your inner thighs back, countering the forward action of your tail. Inhale and lift the top of your sternum by pressing the shoulder blades against your back ribs. 3. Now lean back against the firmness of the tail bone and shoulder blades. For the time being keep your head up, chin near the sternum, and your hands on the pelvis. Beginners probably won’t be able to drop straight back into this pose, touching the hands to the feet simultaneously while keeping the thighs perpendicular to the floor. If you need to, tilt the thighs back a little from the perpendicular and minimally twist to one side to get one hand on the same-side foot. Then press your thighs back to perpendicular, turn your torso back to neutral, and touch the second hand to its foot. If you’re not able to touch your feet without compressing your lower back, turn your toes under and elevate your heels. 4. See that your lower front ribs aren’t protruding sharply forward, which hardens the belly and compresses the lower back. Release the front ribs downward and lift the hip points up, toward the lower ribs. Then lift the lower back ribs away from the pelvis to keep the lower spine as long as possible. Press your palms firmly against your soles, with the bases of the palms on the heels and the fingers pointing toward the toes. Turn your arms outwardly so the elbow creases face forward, without squeezing the shoulder blades together. You can keep your neck in a relatively neutral position, neither flexed nor extended, or drop your head back. But be careful not to strain your neck and harden your throat. 5. Stay in this pose anywhere from 30 seconds to a minute. To exit, bring your hands onto the front of your pelvis, at the hip points. Inhale and lift the head and torso up by pushing the hip points down toward the floor. If your head is back, lead with your sternum to come up, not by jutting the chin toward the ceiling and leading with your brain. Rest in Child’s Pose (balasana) for a few breaths. In celebration of Valentine’s Day, I thought I’d write a little about forgiveness, as it truly is a way to open our hearts, and tap into the love and compassion that abides here, for ourselves and others. The idiom “find it in your heart”, according to the Cambridge online dictionary, means “to be willing and able to do something unpleasant or difficult”. More often than not, I’ve heard this idiom finished with… “to forgive”. Find it in your heart to forgive. What is it about forgiveness that is so challenging? Why is it a job for the heart? Forgiveness is challenging (if not near impossible), if you mistakenly (but understandably) think that it means you are saying that whatever was done wrong to you, was okay. And most of the time, that is simply not true. Some things are not okay, and never will be. Forgiveness can also be difficult because it can ask us to be really honest with ourselves and look at our own weaknesses and imperfections. True we may not have done exactly what was done to us that warrants our forgiveness, but have we not also hurt another in our life? Even if, by accident? Could there be someone out there, who is wanting to forgive us? Most likely, the answer is yes. If we are not able to forgive others, then there’s a good chance we are not also able to forgive ourselves. So why is it a job for the heart? It is in the heart’s nature to be open and expansive, and include all. The heart suffers when we are not able or willing to forgive. When unforgiving, we hold onto the pain in our hearts of what hurt us, even when the initial hurt may be long gone, and even, when the person or persons, may also be long gone. This part of our heart then, which naturally wants to open, is now closed, and is diminished in power and goodness. It has restricted freedom because blame, meanness, or even the desire for revenge or punishment are taking up residence there, and stifling its natural expression. This keeps us caught in the past and prisoner to whoever hurt us. It may also keep us closed off from the present moment and to the people that love us now. To be honest, this was my motivation to forgive who had hurt me in my life. My unforgiveness (which I convinced myself for a long time was righteous), was actually keeping the wrongdoing and the wrongdoers, in my life. My forgiveness is what set me free from it, and them. My forgiveness allowed me to let go of unnecessary pain and suffering, and give and receive love, wholeheartedly. Maybe we need to look at forgiveness in a different way. 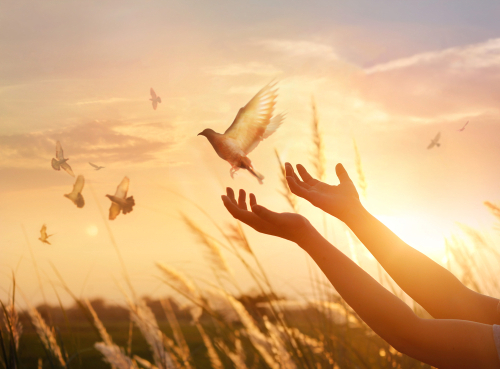 What if forgiveness is a way to our heart's freedom? And I would answer, “Compassion”. Often those that hurt others (whether consciously or not), are very often hurting themselves, or have been hurt, and their hearts are partially (or maybe all the way) closed. Can we have compassion then for them? Can we share in their suffering, which is what the word compassion means? Can we also have compassion for ourselves, if we have hurt another? Can we forgive ourselves? Remember when you were little and all the grownups asked, “What do you want to be when you grow up?” I never knew how to answer that... First, would I know when I was a grown up? I guess I am now, and in casual adult conversation, people often ask, “So, what do you do?” The answer came easily when I had a defined job outside the home, “I trade bonds for Citibank” or “I am a first grade teacher” But, as a stay-at-home mom, I was perplexed by how to answer that. What do I do? One day I heard myself respond, “Oh, I am just a mom.” WHAT? Did I just say that I was ‘just’ a mom? Isn’t that among the most noble and fulfilling roles ever? I was tasked with raising good humans, loving them unconditionally and feeling their hurts a million times worse than they felt them. Nothing ‘just’ about that. So about those kids - well they started to grow up. And leave for college. One down. Then the second. Gulp... One more at home and the years are flying by. I was holding on for dear life. Big Gulp. After a college dropoff, the hives set in. Suddenly I was covered with red itchy patches. Everywhere. I did all sorts of investigative work. I went gluten free. Dairy free. Nightshade free. I gave up wine and cookies and eggs and nuts and coffee. (Note - not chocolate. Let the record show I never give up chocolate). I joined a nonprofit providing microgrants to women in Africa. I went back to school to take my prerequisites for med school. I volunteered in the hospital. I was desperately seeking a purpose. And relief from the hives. Then I took a yoga teacher training. And I found something I had been overlooking for a long time. I didn't need a label, a title, any letters after my name. I discovered a passion. My passion for wellness & health in all things - be it animals or children, bodies or minds - had been there all along. To realize it took some hives, then hospital volunteer work, add in some anatomy classes and then that yoga teacher training. And now, I own a beautiful yoga studio with world class teachers. Each step on the brick road filled my nerdy brain with countless facts about bodies and minds, as well as fulfilled a desire to spread wellness to others. Many of us yearn for a purpose. To feel fulfilled. To find that magic. But maybe the magic is actually in the journey. For me, as each experience began, other options unfolded. Being open to each new idea meant wandering down many paths. Some not so good. Discovering the passion is the journey. We look under each rock and around each corner. We may never grasp that elusive pot of gold for with each step closer, it is ever evolving. - Kim Lally and her husband Bob are the owners of Nest Yoga | Oakland. Bob manages the finances and is number one handyman. Kim does the rest. They have 3 grown children and two dogs. They make a good team. 1. Stand in Mountain (tadasana). Shift your weight slightly onto the right foot, keeping the inner foot firm to the floor, and bend your left knee. Reach down and, with your left hand, clasp your left ankle. 2. Draw your left foot up and place the sole against the inner right thigh. If possible, press the left heel into the inner right groin, toes pointing toward the floor. If this isn’t possible, position the foot lower down on the leg, though never directly against the knee. The right leg should be angled slightly relative to the floor so that the center of your pelvis is directly over the right foot. 3. Rest your hands on the top rim of your pelvis. Make sure the pelvis is in a neutral position, with the top rim parallel to the floor and the two hip points equidistant from the wall opposite you (assuming you’re square to the walls of your practice room). 4. Lengthen your tail bone toward the floor. Firmly press the left sole against the inner thigh (or the inner leg) and resist that pressure with the outer right leg. Touch your palms together in anjali mudra, resting the joined thumbs lightly against the sternum. Gaze at a fixed point in front of you on the floor, about 4 or 5 feet away. 5. Stay for 30 seconds to 1 minute. Step back to Mountain with an exhale (the hands touch the hips as the raised foot comes to the floor) and repeat for the same length of time with the legs reversed. - Modifications & Props: You can stand with your back braced against a wall if you feel unsteady in this pose. - Variations: Stretch your arms straight up toward the ceiling, parallel to each other, palms facing, or touch the palms together forming an inverted V with the arms. - Follow-up Asanas: Vrksasana is an excellent preparation for any standing pose. - Beginners Tip: If your raised foot tends to slide down the inner standing thigh, put a folded sticky mat between the raised-foot sole and the standing inner thigh. - Advanced Tip: As with Tadasana you can challenge your balance by practicing this pose with your eyes closed. Learn to balance without any reference to the outer environment. chaturanga = four limbs (chatur = four; anga = limb) (SPELLING NOTE: The Sanskrit “c” is pronounced like the “ch” in “church.” Properly then, “chatur” should be spelled “catur.” The “h” has been added to make the pronunciation easier for non-Sanskritists). 1. From Adho Mukha Shvanasana (Downward Facing Dog Pose), swing your torso forward into Plank Pose. 1 Align your shoulders over your wrists (so the arms are perpendicular to the floor), and firm your shoulder blades against your back torso. With the torso parallel to the floor, lengthen your tail bone toward the heels. 2. On an exhale, bend your elbows and slowly lower your torso and legs to within a few inches of the floor. It’s common in this pose for the lower back to sag toward the floor and the tail bone to poke up toward the ceiling. To counter this, firm (but don’t tuck) the tail bone toward the pubic bone, and firm the lower belly to bring the navel and the pubic bone closer together. Alternatively, if you lack the strength to hold the torso/legs off the floor, then it’s acceptable to bend the knees to the floor for extra support. 3. Broaden your shoulder blades and hold the upper inner arms close to the sides of the torso, don’t let the elbows splay. You can stay on the balls of your feet or swing slightly forward onto the tops of your feet with the toes pointed back. 4. As you do with Downward Dog, firm the bases of the index fingers against the floor. Beginners should look down at the floor, more experienced students can look forward as long as the back of the neck doesn’t get compressed. 5. Chaturanga Dandasana is one of the positions in the Sun Salutation sequence. You can also practice this pose by itself, holding anywhere from 15 seconds to a minute. When you’re ready to exit, release yourself to the floor with an exhale. Alternately, you could press back on an inhale to Downward Dog; just be sure not to arch back and compress the lower back. Keep the spine long and press back from the top thighs. In Plank, position a block on one of its sides (about 4 inches high) under each shoulder; each thumb should touch the end of the block that faces toward you, each index finger is then placed alongside the outside face of the block. Slowly lower your shoulders onto the blocks. If you need more support, position a third block under your thighs. You should then ideally be well supported and can get a feel for what the completed pose is like. In Chaturanga, rock back slightly, then quickly, on an exhale, hop yourself slightly up and forward, landing a few inches ahead of where you started. Continue for a few more forward hops, then try to hop backward, back to where you started. This is called Nakrasana (knock-RAHS-anna), which Mr Iyengar calls the Crocodile, but which may also mean Alligator. 1 NOTE. “Plank” is what this pose is typically called in English; however, if we want to “Sanskrit it up” we can call it “phalakasana” (pa-la-KAHS-anna; the “ph” pronounced like the “p” in “pin” or “path”), phalaka = plank. To Sing....or to Sing Out Loud? Copyright 2018, Yoga Enterprises LLC. All rights reserved.